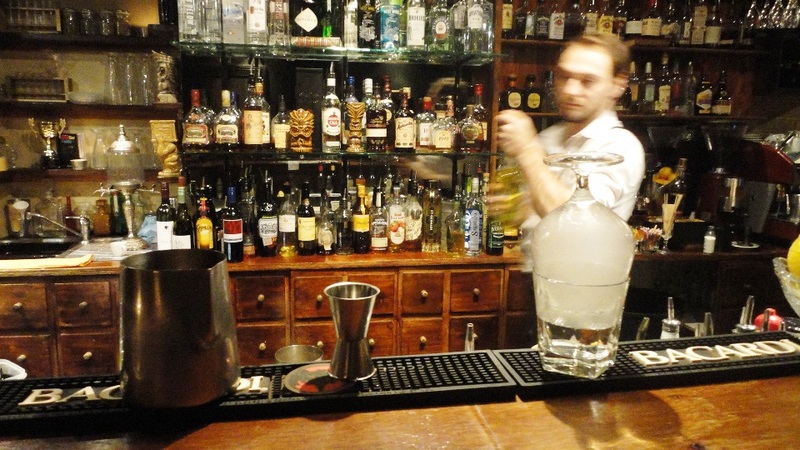 In a bar nestled deep in chic Brunswick Street and shrouded in mysterious decadence, a Yarra City resident developed a framework of terminology and experimental processes to distil the perfect potion. Here the profound powers of alchemy remain alive in the transmutation of base ingredients into liquids that stimulate the senses. 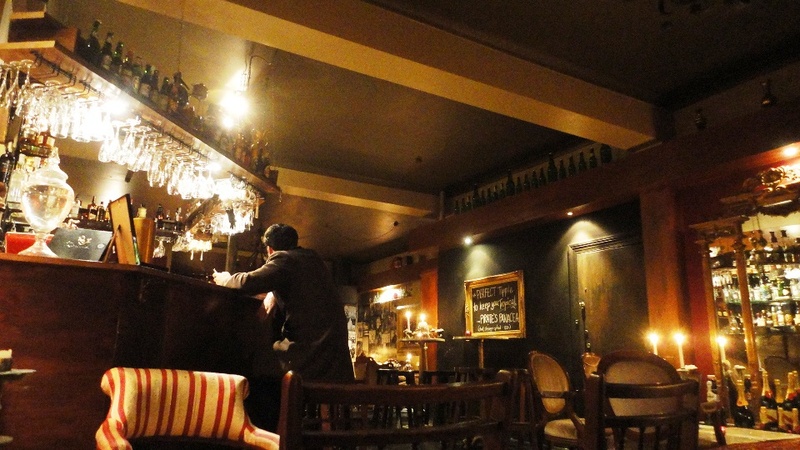 Stepping off the grey sidewalk and past unadorned doors, I entered into the Montmartre hotel lobby of The Alchemist Bar and Café, complete with a back bar comprising of pharmacy cabinets older than a century and French baroque-inspired lounge areas. To my left, a customer chatted with the manager-on-duty, Ms Hannah Keirl, and two lovers exchanged quiet words on the lounge on my right, while sentimental songs of bygone era crooned in the background. The scene before me had a splash of romantic rendezvous in the former Hemingway Bar at The Ritz Paris, shot with the artistic Parisian of Closerie des Lilas, and a measure of the chemistry lab feel of New York's Apothéke with its back bar filled with antique medicine bottles. Opened in 2009, this refined yet casual venue was the long held dream of finance professional turned F&B operator, a resident of the City of Yarra originally from India. 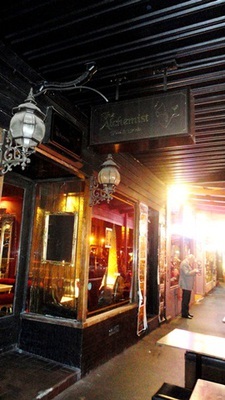 She was inspired to offer a warm, inviting and relaxing ambiance, when coupled with the search for the perfect elixir, tasty food and friendly staff, would have customers coming back time and again for their favourite cocktails or new seasonal potions. I caught the eye of the ever-attentive Hannah. With her bubbly disposition and warm smile, conversations flowed readily. Originally from Sydney and a self-confessed bar-nerd, Hannah has been working the cocktail bar scene for over 3 years including the recent 10 months with The Alchemist Bar. 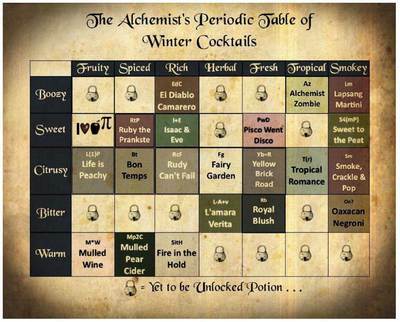 She is particularly fond of the establishment's signature periodic table of potions, which allows the eclectic talent behind the bar to work with patrons' palates and extend their tasting experiences to spirits and house-made ingredients that they would not necessarily consume. It's an interesting way to consider flavours which I might not have otherwise chosen. The challenge that remains is getting patrons like me to try new concoctions without alcohol bias. 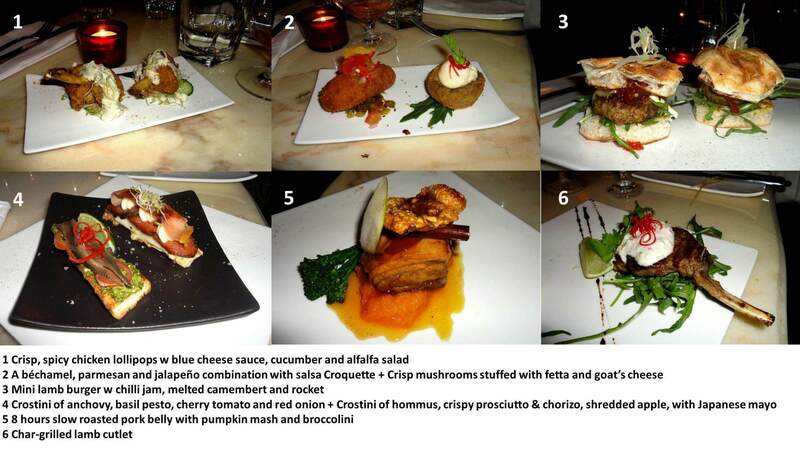 Seems I'm the perfect customer, having no idea what to expect, and a seeker of new flavours and experiences. With a mischievous grin, Hannah was off to the alchemy lab to brew the perfect elixir to extinguish all winter chills. 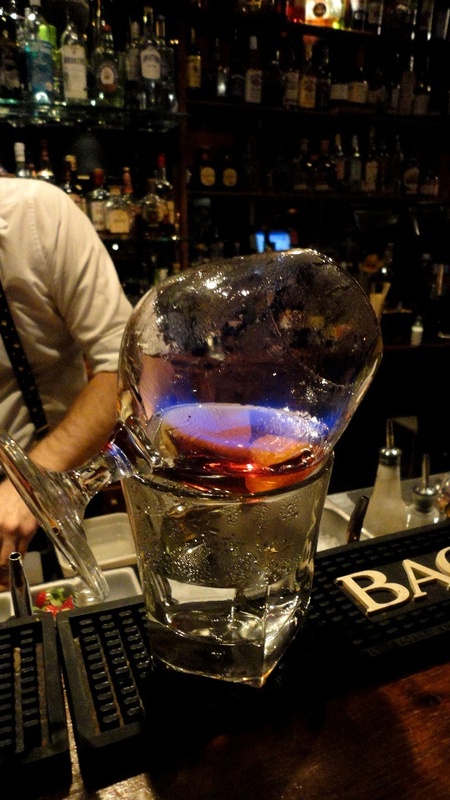 Fellow bartender Pete was readying the lab bench for a blazing experiment. Calculated shot, spoon, dash and soon blue flaming liquor rolled from one steel jug to another. Alas, the 'Fire in the Hold' was born. The applied science of heat to alcohol caramelised the sugars for a mellowed flavour and drew out aromas for a scent-sational experience in a brandy glass. I had orange zest on the nose and the palate swirled with velvety toffee caramel that together reminded of Christmas by a warm fireplace. 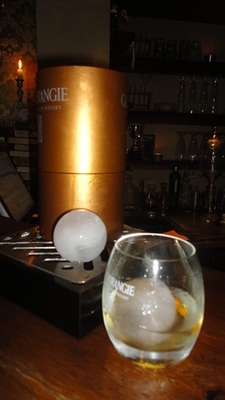 Hannah's twist to Jerry Thomas' 1800s Blue Blazer was an easy drinking winter warmer incensed with character and layers of spiced rum, grand marnier, yellow chartreuse, white chocolate liqueur and aged bitters. The flaming appetiser was followed by a cocktail entrée of sloe gin, wattle toffee liqueur, amaro montenegro, cloudy apple juice and house made lemon butter. I beheld the carved wooden goblet capped by a deliciously red apple, which whispered of the devilish alchemy applied on Snow White. The frothy white contents released a nose that hinted of roasted coconut and hazelnut with a light and refreshing sweet yet subtly spicy body. 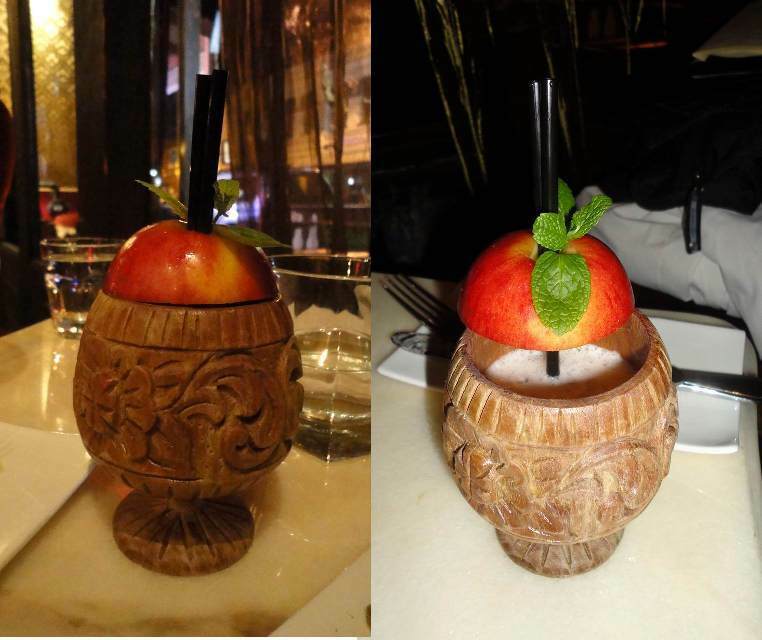 The apple is a Greek mythological symbol of knowledge, immortality and temptation and 'The Isaac & Eve' for which this sinfully delectable potion is named, may just be the forbidden drink of many modern day Adams and Eves. The application of amaro montenegro continues the romantic couple imagery with sovereign Victor Emmanuel III and Princess Helen of Montenegro, the second queen of Italy, which the name of this liqueur pays homage to. To complete the liquid meal, Hannah distilled an all-time American favourite pastry into a cocktail desert. 'I Love Apple Pie' was a mouthful of baked apple goodness, the transmutation of applejack, apple genever, lemon juice, house made cinnamon sugar, vanilla syrup and house made apple puree into a layered serving that mimicked the pie crust and its golden contents. This was simply what liquid apple pie tasted like. The use of applejack retained the American colonial connotation while the touch of apple genever introduced an invention of 16th century Dutch chemist and alchemist Sylvius de Bouve and a European flavor consistent with the French baroque inspired surrounds. 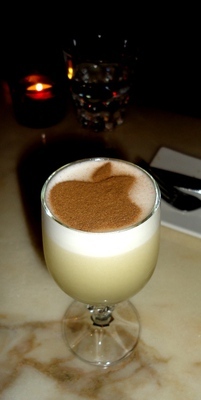 The apple-shaped dusting on the cocktail would secure the thumbs up from many Apple executives and fans. 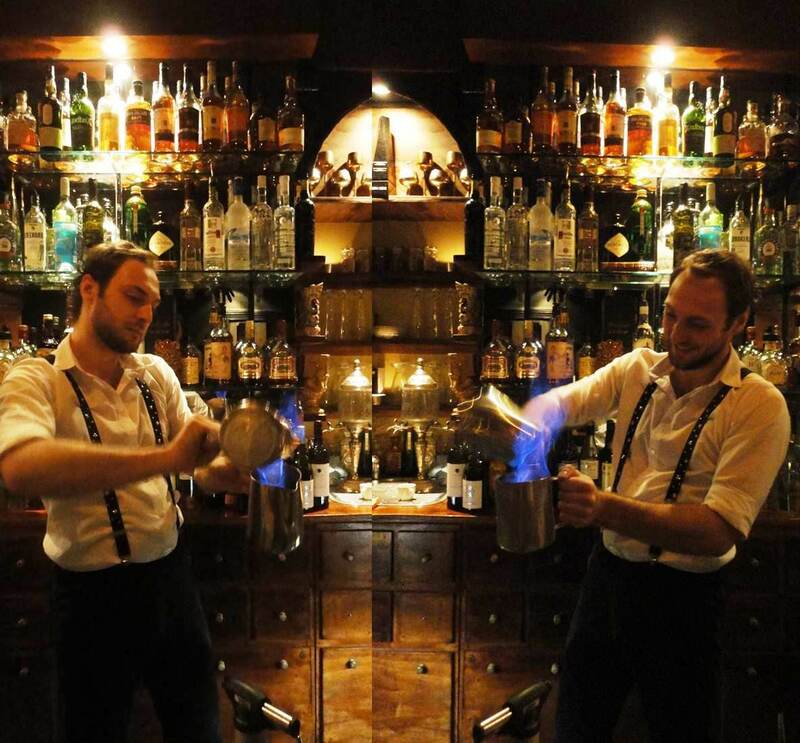 Here bartending is not about bottle flips and long pours but the composition of your potion, presented in a manner that befits the alluring contents. Forget about history in a glass and classic cocktails for that moment. 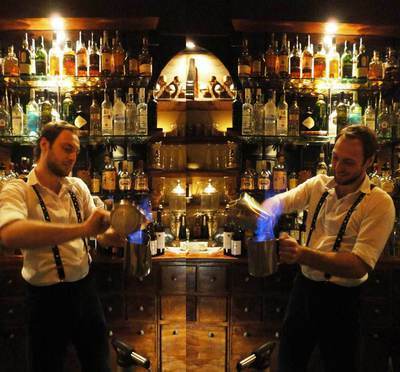 Short of the lab coat, the bartender is a cocktail apothecary, fusing mixology with scientific techniques to create flavours and textures that challenge the palate and push the boundaries of atypical mixes. While television programs like MasterChef Australia promote culinary skills, the science and art of bartending as well as the profession remain largely unrecognised in Australia. The Havana Club Grand Prix which is a global celebration and competition of bartending skills from around the world would surely be a destination for bartending talent in establishments like The Alchemist Bar and Café to display their innovation and experimentation founded on knowledge of the classic cocktail. As the evening weighed on, Hannah worked the bar and room, attending to orders and chatting with guests without diminishing her service levels, while still checking up on my drinks and introducing me to the bites, bigger bites and tasting plates. Relishing the element of the unknown, I left my tapas fate to Chef Daniel Zinetti. 1. First up was the chicken lollipop, fried golden and crispy to the bite, accompanied with blue cheese sauce. I preferred a thinner coating over chicken seasoned for a longer duration. 2. The croquette was a crusty envelope of smooth creaminess and I await a fiery version blended with a measure of jalapenos. The crisp mushroom remained soft and juicy, with sharp flavours from the creamy feta and goat cheese. 3. A personal winner arrived in the layered flavours that accompanied each bite into the mini lamb burger. The crunch of crispy skin bread was replaced by sweet and jammy chilli, which quickly perfumed into Middle Eastern spices on tender lamb patty, complete with the crunch of peppery rocket. 4. I felt the generous layer of anchovy lent a sharp saltiness that muted the basil pesto while the crispy prosciutto and chorizo were both vying for my palate's attention. 5. The Chef's special was the 8 hour slow roasted pork belly resting on pumpkin mash. I enjoyed biting into the waffle crackling skin like a biscuit and the harmonious union of glutinous pork fat and meat melting in my mouth, sweetened by caramelised apple. 6. The lamb cutlet was grilled medium and remained juicy to the bite. Despite my nit picking, Chef Daniel's overall culinary quality and attention to detail of taste and plating was above my original expectation of bar food. Created as a result of a Fijian holiday where the owner determined once and for all that corporate life was no longer for her and that the only thing that would really satisfy her was to follow her dream, The Alchemist Bar and Café inspires. The blend of golds, reds and browns, bold floral patterns and gilded woodwork, soft draperies of satin and velvet, textured couches and accent chairs and candle light all work together to serve up a romantic palette, ideal for quiet dates and private functions 7 nights a week. 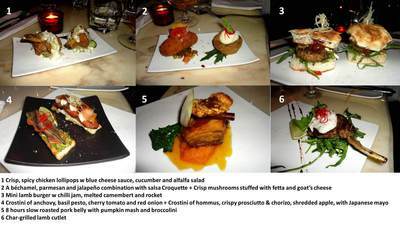 A magician who appears on the first Wednesday of each month to razzle dazzle table by table adds an entertaining element to special occasion parties. With the growth in tapas or sharing style bar dining around Melbourne and the current quality of cocktails and food served in The Alchemist Bar and Café, the owner is in a position to create a bar restaurant that is very much a destination in its own right. 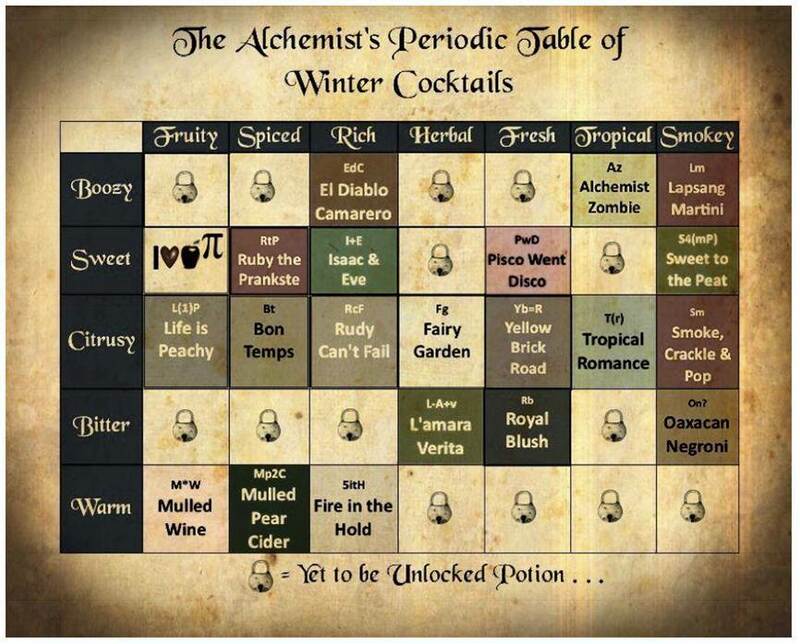 The successful application of alchemy to the pairing or matching of food to cocktails will take the patron's bar dining experience to the next level much like fine wine and food. 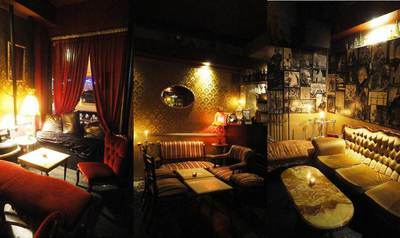 Throughout the evening, a continuous traffic of Melburnian men and women in their 20s to 40s come in for a quiet drink or reside for hours enjoying the cosy ambiance. As I savoured my final drink of Glenmorangie whiskey made cool by a rolling ball of ice in replacement of the passé ice cubes, I can already visualise The Alchemist Bar and Café as a successful destination bar. The familiar and friendly faces of the bartenders like Hannah and Pete paired with the welcoming and cosy living room surrounds make for an intimate rendezvous in Lionel's Melbourne. With thoughts of Paris recessed, I bid the bar au revoir and à bientôt! 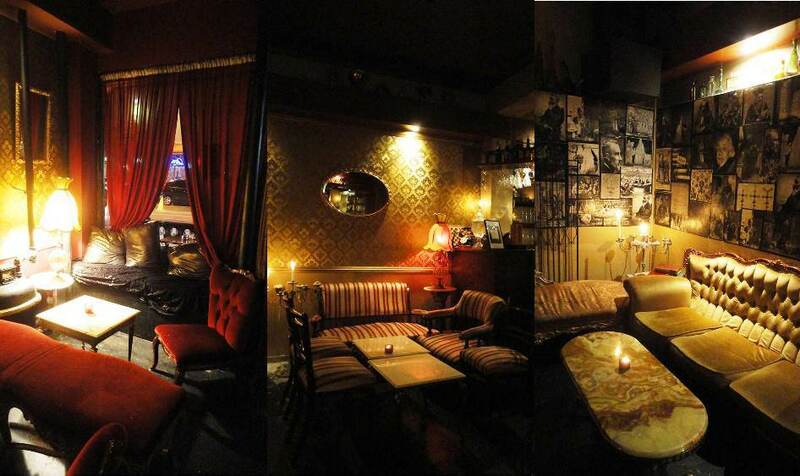 This place looks delectably lush. Must visit next time I'm in your lovely city.